Mule Deer are one of the most iconic wild animals in the Western United States. They are primarily based west of the Missouri River and range from Alaska to Baja Mexico. 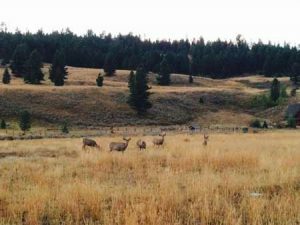 The great state of Montana is a place where mule deer thrive, which means it's common to spot these wild animals when you're in Big Sky Country. This ungulate's scientific name is Odocoileus hemionus and it is the largest member of the Odocoileus genus. 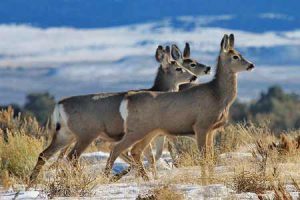 Mule deer are abundant in Big Sky Country and are one of the more popular game animals for hunters. Mule deer are named after their mule like ears that are approximately 3/4 the length of their head. They are brownish-gray in color with a white patch on their behind and a small white tail. Mule deer are typically 3 to 3.5 feet at the shoulder and measure 4.5 to 7 feet long with a 5 to 8 inch tail. Males are called bucks. Females are does. Babies are fawns. Mule deer can weigh 130 to 280 pounds. Mule deer have antlers with beams that sweep out and up forking twice. Bucks generally have a total of 8 to 10 points. Antlers can grow up to 1/4 inch per day. Antler growth stops in August and then the antlers harden. When startled a mule deer will bounce away by pushing all four hooves off the ground at once. This is called "stotting." Mule deer can jump 2 feet high and up to 15 feet in distance. A mule deer's eyes are located on the side of its head providing 310 degrees of vision. They have better night vision than humans and can spot predators up to 600 meters away. Threats include bears, mountain lions, coyotes, humans, and cars. Their sense of smell is 1000 x's stronger than a humans. They can smell a person up to half a mile away and can detect water up to 2 feet underground. Mule deer can run up to 45 MPH. These animals are generally inactive during the day time. They are selective eaters that always opt for the most nutritious weeds, leaves, twigs, and shrubs. 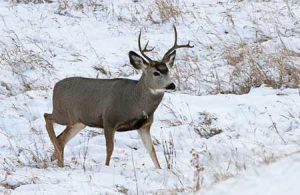 Mule deer mate in the fall and winter during the rut season. Gestation is about 204 days. A doe gives birth to 1-4 fawns in May or June. Fawns have speckles on their backs and leave their mother in about a year. 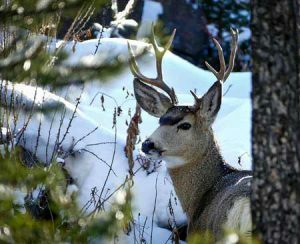 Keep your eyes peeled and there is a very good chance that you'll spot a mule deer while you're in Big Sky Country. They are around all year long. Watch out for them in neighborhoods, on the ski slopes, during your hikes and bikes, and definitely while you're driving around dusk and dawn. These majestic animals are always fun to spot, but please give them space and always respect wild animals. If you capture a cool wildlife photo of a mule deer when you're in Big Sky Country be sure to share it on social media with #visitbigsky.